This week the government held a press conference to announce their overhaul of the current mental health system. The media is celebrating this announcement as the Turnbull Government finally listening to the cries of it’s most vulnerable citizens. However I have a few concerns about the announcements and the potential for the changes to make things much worse than they already are. The main selling point for the overhaul seems to be the personalised care plans, which in theory do sound great. It would be amazing to have a system that focused purely on the needs and wants of the client, rather than a one size fits all approach. After all, everyone’s experience of mental illness is different and as such, we all need different approaches to health care. The government is talking about a “stepped care” model of treatment that focuses on patients varying levels of care. This model has also been likened to the current NDIS, a system which has already shown to be inadequate for the needs of the disabled community. I’m also concerned about who will be determining the services that a patient needs. Will there be avenues for reassessment if a patient who was once happy with a hands off approach becomes more unwell? Will an official diagnosis be required in order to receive these services? Part of the new approach to mental health care is utilising online and telephone counselling more often. This is another great initiative, especially for those who live in rural areas and are unable to access adequate mental health treatment. Online and telephone counselling services will also open up counselling to those struggling with psychiatric conditions that make it difficult to access in person care. Of course there is also the added anxiety if it is up to the client to initiate these services. I know that myself and others struggle with phone anxiety. In the announcement, Turnbull stated that the current level of federal government funding would remain unchanged at 10 million per financial year. Again this is quite concerning. The current amount of funding is inadequate to provide a one size fits all model of care that focuses on crisis care rather than long term treatment. I’m really not sure how this new model can be implemented without additional funding. I worry that this will be nothing more than a pipe dream, with those on the ground bearing the brunt of the frustration. Currently everyone can access 10 subsidised sessions to see a mental health professional under the mental health plan. The overhaul appears to remove these sessions and replace them with the steps approach to care. The government has touted this measure as proof that they are listening to the people of Australia. However I’m not sure that absorbing these sessions into this step model of care is the right way to go about this. Again, will an official diagnosis be required to access these sessions? I do think it’s great that the Turnbull Government is finally focusing on mental health treatment in this country. It has been pushed to the side for too long. However I do worry that this is being sold to the voters as a revolution when in reality it has the potential to make things worse for a lot of vulnerable people. It’s appalling that while the government is paying attention, that they are still failing to realise that the mental health system is seriously underfunded. Paying attention is a step in the right direction, but at the moment it’s just words, we need them to put money where their mouth is. Do you think that the varied step model approach is the right way to go? What ways do you think that the current government could improve mental health services in this country? This entry was posted in Uncategorized on November 28, 2015 by Tegan. I agree with your concerns and am too worried that without extra funding that the pressure will be out back on those in the front line of care. Those whose lives matter too, and those who are already vulnerable due to the lack of support that they have to offer. This link provides insight into just one of the no doubt many cases of the effects on mental health workers when they are restricted with the care they have to offer. Don’t be put off by the source of this article, it is in fact an excerpt of another article in which I can’t find the link anymore. Such a tragic and heartbreaking story. Very concerned with the changes. No conservative (liberal) govvernment has ever implemented any changes except to worsen things for the most in need, to up charges and strip services. I fear this will be no different. Sorry about the typos. This keyboard is awful. Sadly stuck with it for the foreseeable future. That funding is paltry, and so inadequate for such a pressing social need. I struggle with the idea that governments fail to realise that underfunding in this sector is the worst kind of false economy. 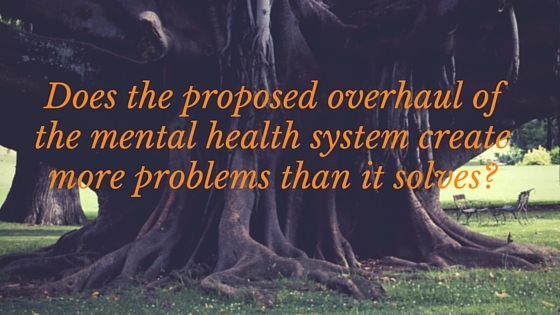 Not funding mental health adequately has knock on social costs in so many other areas. I wish we prioritised this more as a society.